Looks like the Kul Tiran bear in World of Warcraft but this was made so long ago! You do so many great drawings! awesome pics or drawings, this are truly amazing. I will be using most of them in my up coming book. The head dress and the arm adornments are fantastic additions! You know you've been playing too much Dragon Age: Origins and Dragon Age II lately when you look at this... and instantly think of the "Dalish Elves". Seriously, I love this piece here. Excellent work, bro! I shall huggle him and name him fluffy. P.S. Fantastic work! It took some time until I noticed the elf besides the bear... O.o And that as me being an elf affectionate. Must be really mighty bear then. That`s a cute little bea....no its not ist`s an awesome guardian of the forest. He looks at me and I would be like: no thanks don`t wanna pass, I`ll go hame right now. ^^ Love the colors. You are amazing. Sorry, that might be a bit weird. I'm sleep deprived (goofy grin) BUT this is really good, I wish I could do something this skillful! 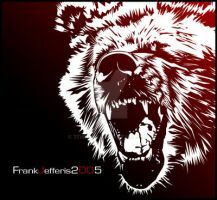 wow i love this... would be scary if that was a real bear.. o.o very talented ! Remind me to never go into this part of the forest! meh! awesome rly! i love bears! I have been searching for the artist of this picture for a while now.